Lakshmi Prasad brought his hands together to go around the palm-tree trunk, pulled one foot in front of the other, and smiled for the camera. His toes kept up the pressure on the trunk with an alacrity belying his 73 years and Prasad crawled up alternately moving his feet and hands. By then Prasad’s song had touched a crescendo. “Gur banta hai is khajur se, vaid sushil bade bhaiyya the unki yeh prabudhta aayi.” Sewa Ram translated, almost in unison. “We get jaggery from the juice of the palm. We owe this bounty to elder brother, the great herbalist”. Later I came to know more about this figure of veneration: the bade bhaiyya. Laxmikant Misra was not originally from Sugra. When he came to Sugra 50 years ago as a functionary of Khadi Gramodyog, jaggery making was not widespread in the village. Misra, who also had some knowledge of ayurvedic medicines, is credited for introducing residents of the village to jaggery’s therapeutic properties. “It’s really good in curing stomach problems,” Sewa Ram said. Pallu was one of the first to learn about jaggery from Misra. “Those days I could climb more than 40 trees a day,” he said flashing a toothy smile. He adds: collecting the juice is an art, we have to make sure it does not become taadi (toddy) or we could end up spending six months in a prison. By this time, Sewa Ram's son Vishwanath had joined us. "I have cleared the intermediate exams, but I do not want to move to the city. I would rather stay in the village and take this tradition forward," he said. Pallu gave the youngster an appreciative pat. The veteran gur collector's face fell. "I am not sure people would stay back in the village for gur," he said. Sewa Ram nodded in agreement. We make between Rs 200 and Rs 300 a day during the gur season: September-January. But for the last five years, we have been extracting less palm juice than usual. Less juice means less jaggery," he said. Pallu ascribes the decline in productivity to the persistent drought in Bundelkhand. Sewa Ram shakes his head in disagreement. "Drought is not the only reason for low productivity," he whispered. 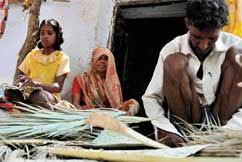 His son Vishwanath speaks out in support: "The leaves of the palm tree are used to make brooms and hand fans. Most of it used to be made by people in Sugra. 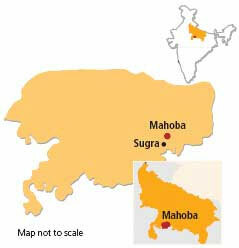 But now contractors from Mahoba take away the branches of the palm trees." Engrossed in the conversation, I did not notice that a quiet crowd was milling around. A middle-aged woman in the gathering shouted, "The government needs to take steps to either keep this going or find alternative employment for us." My companion Manoj Kumar, who had been quiet all this while, said this was Amra Yadav. He asks our most recent interlocutor to come forward. Yadav is, however, a reluctant speaker. "Another city reporter," she mumbles sceptically. She does speak up at Kumar's insistence. "The knife, the gur collector's most important tool lasts only three years. And it's available only in Kolkata. So every three years, we have to either make a trip to Kolkata or depend on traders to get it for us. Either way it is expensive," she said. Kumar tells me his organization, the Kriti Shodak Sansthan, has managed to pursue the state’s Khadi Gramodyog to sanction craftsperson cards for Sugra’s gur collectors. The card, it seems, is a touchy matter. “Sanction is alright, but where is the card?” Pallu asked. “Yes, yes where is the card?” the crowd shouted.